So, I’ve decided to list ten pilot episodes of shows that have passed every test in my book and landed in the “solid pilot” pile. But what you’re about to discover is something pretty interesting: I don’t like some of these shows anymore. While these series may have developed pilots that passed with flying colors, some of them are shows that I merely fell out of love with, and some – shockingly! – I even detest now. Pilots are episodes that are important, as I said earlier, but are not always indicative of a show’s consistency to be spectacular. Also, it’s interesting to note that the exact opposite is true. So just because a show is absent from this list or, conversely, because it’s on it, don’t assume that this is indicative of my present feelings toward the series. With that, are you ready to see which pilots made it onto my list? (Don’t worry, guys. I still have a LOT of great pilots that have been suggested – LOST, Alias, Friday Night Lights – that will not be on here, merely because I have not seen the series yet.) Well, then, let’s head back to the very beginning! Contrary to what may be a popular belief, you can be both a fan of Community AND The Big Bang Theory! Both are entirely separate and different shows, so it’s really like comparing The Hunger Games and Harry Potter. I don’t remember exactly who it was that convinced me to start marathoning The Big Bang Theory, but a few summers ago, I did just that. One wonderful website with television links later and I was ready to begin the CBS hit comedy. And, to be honest, The Big Bang Theory has a pretty solid pilot. It nicely sets up the characters of Leonard and Sheldon, two socially inept scientists (one a bit more so than the other) who live together in California. An attractive, perky neighbor from Nebraska named Penny moves across the hall from the pair in the pilot episode. The first episode of the series is really an introduction to these three characters (with the additions of Howard Wallowitz and Raj Koothrappali) and sets the foundation for the rest of the show as a whole. The pilot is funny and engaging, and you find yourself wanting to see exactly what will happen when four scientists attempt to interact with a beautiful, blonde neighbor. Jim Parsons really strikes me in the pilot episode, specifically, in his portrayal of Sheldon Cooper. There’s so much that has evolved with the character – in the pilot he seemed very reminiscent of the pilot version of Abed Nadir on Community, especially in the scene where he explains to Penny why he has to sit in a certain spot on the couch. It was very Asperger’s-esque, and I think it’s interesting how Sheldon has evolved as a character from that point and perception. As Kim reminded me recently, How I Met Your Mother’s pilot is one of the most solid sitcom beginnings. No matter how many dips or weird turns this show has taken, the pilot episode featuring Ted Mosby and his search for the woman he’s going to marry will always remain one of the greats. This episode introduced each character in such a great way that it made you desire more. The entire pilot (and vast majority of the series as a whole) is narrated by future Ted. The audience sees Ted’s two children as the episode opens and he explains that he’s about to tell them the story of how he met their mother. And that, kids, is how you hook your viewers and get them to return for more. Oh, trust me, I do. The pilot of Glee introduces us to an array of characters at McKinley High School in Lima, Ohio – a town so small, dull, and stifling that nearly everyone is desperate to escape once they graduate. Will Schuester, a Spanish teacher at the high school and former glee club member, learns that the head of glee club has been fired and gets permission to take over the club. Did I mention that the glee club is something that no one wants to be a part of? In every high school, there is a caste system and glee club is at the bottom. No one is more aware of this than Rachel Berry, an overly enthusiastic performer, whose sights are set on becoming a Broadway star someday who frequently has slushies thrown in her face by the jocks of the school. Rachel, however, is not the only member to join glee club. There’s Mercedes, a young woman with the attitude of a diva, Tina, a stuttering goth, Artie, a wheelchair-bound student, and Kurt, a young man with a flamboyant personality. And then there’s Finn Hudson, the star of the football team who actually has hidden vocal abilities. Will blackmails Finn into joining New Directions, the name he’s given to the glee club, and the young man agrees. I think that the reason I loved the pilot of Glee so much was because everyone knew who they were. Rachel knew that she was a star and (however obnoxiously) lives really believing that. Finn knew that he was a person who had standards and goals and strove to achieve them. Will was a well-meaning choir director, intent on showing his kids that they were WORTH something, even when the entire school told them they weren’t. And then, after season one, it all went downhill. My suggestion: watch season one of Glee. It’s VERY good. But pretend that it ends after that. It’s best this way. I didn’t understand my friends and their obsession with Firefly until I watched the (long) pilot episode of the fandom-loved Joss Whedon show. And then, having watched the pilot, I fully understand why this show is as beloved as it is. “Serenity” is a lot different from most television pilots. For starters, it’s two hours long, so there is plenty of time to develop plot and character. As I did my research, I noticed that FOX had the same thought I did – “Serenity” didn’t feel quite like a pilot, so “The Train Job” was aired as the pilot instead by the network. Nevertheless, “Serenity” is the first episode I saw of the acclaimed (and short) series, and it was brilliant. The episode introduced us to Mal Reynolds and Zoe Alleyne, Browncoats who fought against the Alliance and lost… badly. Six years later, Mal, Zoe, and his crew (including Zoe’s husband Wash, the ship’s engineer Kayle, and Jayne – a callous and snarky gun-for-hire) sail the skies in an older ship called Serenity. Plenty of plot occurs throughout the pilot – the crew makes their living on Serenity doing various jobs. Namely, they steal goods and deliver them elsewhere. But when Serenity lands on a planet to pick up travelers to help provide additional income, things begin to go awry, and it becomes clear that Mal and his crew are now housing fugitives (which doesn’t bode well in his whole plan of keep-off-the-radar-of-the-Alliance). And thus, the plot unravels and thickens, setting the stage for the rest of the season. Admittedly, I never really understood why people raved about Nathan Fillion. I don’t watch Castle, and I obviously hadn’t seen any of Firefly (I STILL HAVEN’T FINISHED THE ENTIRE SEASON YET, SO NO SPOILERS), but upon starting the show, I realized EXACTLY why. Nathan plays Mal, who is a bit rough around the edges, but – deep down – noble. He’s funny, snarky, and charming. I momentarily flailed (yes, it’s a thing) when I recognized the actress who played Zoe as the same woman who played Jessica on Suits (a show I had marathoned prior to Firefly). If you like fun, wit, action, and just enough suspense to keep you on the edge of your seat, then I definitely recommend Firefly’s pilot (and the rest of the series, too). Smash is a show I was over-the-moon about prior to the pilot. Each time I saw a commercial for the new musical drama, I squealed and acted like a giddy child on Christmas morning. The show had so much promise – it was being heralded as the Broadway version of Glee. And, upon watching the pilot, I had to disagree – it was BETTER than Glee. But the pilot of Smash? It makes my cut (and ranks pretty high, to be honest) because it was brilliant. It introduced us to the characters of Ivy and Karen – two young women living in New York City, desperate to prove themselves to the world, and – specifically – Broadway. We’re not meant to hate either of them in the pilot, because neither is portrayed as a villain. Ivy has been in the chorus (ensemble) for years and is desperate to break out of that. Karen is new to the Broadway scene, hailing from the Midwest and desiring to become a star. Her parents are entirely disapproving of her decision to move into the city to pursue her dreams. Ivy’s mother, similarly, is disappointed in her daughter’s lack of evident success. And you really do feel empathy toward both women – you’re hoping that they both become stars. And then they both get callbacks to audition for Marilyn Monroe in a production that two best friends and songwriters are creating. (As a sidenote, Christian Borle is nearly the entire reason I started watching this show and I have no regrets about that.) And then, there’s Derek, the snarky and surly director and Eileen, the tough producer, interested in taking on the project of a musical version of Marilyn Monroe’s life. Smash began ambitiously, pulling out all the stops for its pilot – it threw characters, choreography, big names, and even bigger songs at its audience. Sadly, there was no way to go, then, but down for the show. It quickly sacrificed character development and plot for soapy drama and absurdity. The writing rapidly declined in quality, a la Glee, and has – to this day – caused me to detest the existence of the show (and its recent Golden Globe nomination). But watch the pilot, and I’m sure you’ll be impressed, as I was. Just, you know… forget about watching everything that follows. I like to talk about Ben and Kate as much as I can, because I’ve heralded it as “the best new thing that no one is watching.” I don’t quite recall exactly what drew me to the pilot of this show – I had been curious, I think, about the new FOX fall line-up, having already fallen in love with New Girl. So I chose to watch, in advance online, the pilots for Go On, Ben and Kate, and The Mindy Project. Only one of these shows managed to capture my attention and, if you’ve read the title of this section, you can probably guess which one. Ben and Kate is a sitcom centering around the Fox siblings – older brother Ben is a slacker who has the tendency to get himself and others into crazy shenanigans. His younger sister, Kate, had to grow up much faster – she became pregnant as a teenager and has been raising her daughter, Maddie, on her own ever since. Ben and Kate’s parents had a bad relationship, and it took a toll on the youngest Fox sibling. But she found that her brother had always been there for her, growing up. In the pilot, Ben rolls back into town, which Kate knows means he’s up to some sort of scheme. The Fox brother reconnects with his best friend Tommy, and discovers that Kate is dating someone – a someone, mind you, that he initially distrusts. Kate solicits her advice about dating from her best friend and co-worker BJ who is, in fact, the best new character on television this season. And then there’s Maddie – Kate’s precocious and adorable little girl, a near spitting-image of her mother in personality. Ben and Kate has everything that a great pilot should have. It establishes main characters and two supporting characters very well – Tommy and BJ are perfect, hilarious counterparts to Ben and Kate. The show is funny, as well, and there are some amazing comedic moments in the pilot (Nat Faxon’s delivery of “He loves someone. At a CONFERENCE” and “There’s so much I want to say! Why are you so young right now?” are examples). But more than that, the pilot of this series has heart. It’s about love and family, and what it means to still need each other, even when you’re adults. So do yourself a favor and go check out the pilot for Ben and Kate. I seriously doubt you’ll be disappointed. When I heard that Zooey Deschanel would be getting her own show, I immediately decided that I would love it. Two seasons later, I’m still a loyal viewer, and it’s thanks in part to the solid pilot episode of the series. New Girl centers around Jessica Day, a woman who recently discovered that her live-in boyfriend was cheating on her. Distraught and desperate to find a place to live, she ventures to a loft where three men live – Coach, Nick, and Schmidt. After initial disagreements, the men allow her to move in… and quickly regret it. Jess barely moves from the couch and watches Dirty Dancing on repeat, sobbing her eyes out over her break-up. This quirky schoolteacher is encouraged by Schmidt to get back in the game and find a rebound (did I mention that Schmidt is a ladies’ man?). With the assistance of her best friend and model Ce Ce, Jess intends to do just that. One of the factors that is important to me when viewing the pilot for any comedy is simple: heart. A show can make me laugh every minute of its pilot episode, but if I am not emotionally invested in some way, shape, or form by the end of it to the characters… well, I’ll likely drop the show from my to-watch list. Which is exactly why New Girl remains on one of my list for best pilots – it’s a show that brought Coach, Nick, and Schmidt to a serenade Jess with “(I’ve Had) The Time of My Life” after they realize she had been stood up. From that moment forward, the show was quirky, yes. Funny? Yes. But it also had – and continues to have – meaningful moments of heart. I should learn to just trust my friends whenever they tell me to watch a show on BBC, because I have yet to be disappointed. Of course, no one tells you when you begin a show that airs on BBC, that it will likely rip your heart out and stomp on it. Let me be that person for you, dear readers. ANY show on BBC will overwhelm you with a sea of emotion. You’ll probably need boxes of tissues and cuddly toys in order to recover. But I digress – I began watching Sherlock due to the strong prompting of my friend Jaime. She convinced me by explaining that there were only three episodes of the first season (they’re nearly two hours long each), so it would be easy to catch up. Much like Firefly’s “Serenity,” Sherlock’s pilot, “A Study in Pink” doesn’t FEEL like a pilot, due to its length and subsequent depth. We meet Sherlock Holmes, a brilliant, high-functioning sociopath (his description) who is a consultant for the police in London. John Watson is a doctor and former soldier and becomes Sherlock’s flat mate, as well as his partner in crime-solving soon. “A Study in Pink” introduces us to the insane brilliance of Sherlock Holmes, the loyalty of John Watson, and sets in motion plot and characters that will become very important throughout the remainder of the season, and subsequent series. Benedict Cumberbatch is nothing short of astounding in his portrayal of Sherlock Holmes – a modern-day genius who has difficulty relating to others, including his own flat mate. The way that Moffat and Gatiss managed to create a modern-day world of Sherlock Holmes (utilizing technology and immersing the audience in things such as text messages as they appear on the screen) is brilliant and inventive. 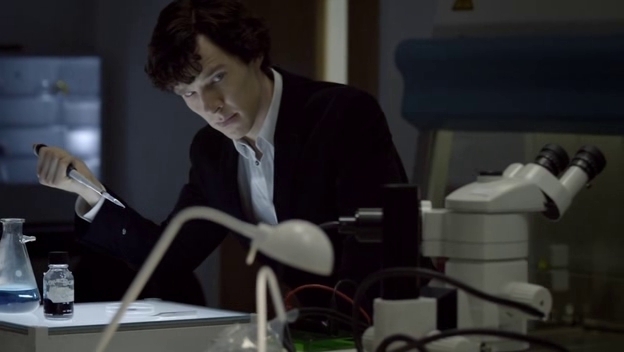 If you haven’t watched the BBC version of Sherlock yet, I strongly recommend that you do. Also, as with any BBC show… bring along some tissues. You’ll need them eventually. Once Upon a Time is the one show whose pilot I anticipated and has not disappointed me severely throughout the remainder of the series. Sure, there have been some… well, rocky moments (basically everything involving Mary Margaret/David) where I’ve rolled my eyes a few times, but the pilot of this show is one of the strongest I’ve seen recently. It’s beautiful, dramatic, and intriguing. It does what great drama pilots should do – draw a viewer in and refuse to let them forget about the show. And truly, Once Upon a Time is a one-of-a-kind show. When learning that the show would center around fairytale characters trapped in a modern-day town with no idea of who they truly are… well, it’s clear that this ABC drama would very easily flop if executed poorly. But, with the creators of LOST at the helm, Once Upon a Time has avoided a nosedive and has instead become one of the biggest hits for ABC. The show centers around Emma Swan, a bounty hunter living in present-day Boston who is, sadly, alone. Apart from her job, she really has no one – that is, until a young boy named Henry shows up at her door, claiming to be her son. As it turns out, Emma had a child ten years ago and gave him away. Henry lives currently in a town called Storybrooke, Maine, with his mother Regina, also the mayor of the town. Henry carries around a book of fairytales and believes that everyone in town is a character from his book – they don’t remember, he claims, because they’ve been trapped by a curse. Henry insists that his mother is the Evil Queen, and Emma (obviously) does not believe a word of his stories. But Henry is right, the audience learns, as the pilot switches back and forth between present-day Storybrooke and a fairytale kingdom of old. Snow White and Prince Charming are the protagonists of that story, both fighting to protect their child from the Evil Queen’s curse. An array of characters assist them in their fight to protect the kingdom, but all hope seems lost when the Queen’s curse takes a hold of the kingdom. Once Upon a Time is one of my favorite pilots, because it sets up a lot of events that will be important throughout the remainder of the season. The audience is aware of the fact that Emma is the savior of the town, that Regina is the evil queen, and that each fairytale character must (we hope) be destined to discover their true identities at some point. It provides just enough intrigue to draw viewers back for more episodes, and transitions seamlessly between the fairytale realm and present-day Storybrooke. And when the clock in Storybrooke – a clock that has been frozen on the same time for as long as anyone can remember – begins to move ever-so-slightly at the end of the episode, viewers are acutely aware of the fact that something magical is coming. Suits is one of the few shows on television that I was convinced to watch solely because of Twitter. So I decided that I would marathon the television series, pleased that I would only have two seasons’ worth of episodes to catch myself up on while everyone else waited for the show to return from hiatus. I watched the pilot… and was immediately hooked. Quite honestly, Suits has the best pilot of any show that I’ve seen recently. It is rich in drama, character development, and is extremely addicting. After you watch the pilot episode, you will WANT to watch the entire series, because of that tug you feel when watching a show where you just HAVE to know what happens next. One element that I was very (pleasantly) surprised about in regards to Suits is how funny it actually is, and the pilot is no exception. The show introduces us to the lives of Mike Ross and Harvey Specter. Mike is a brilliant young man with a photographic memory. He can recall everything and anything you ask him to, which is beneficial in his current job – he is paid by students to take the LSAT for them. After nearly getting caught, Mike considers quitting. Trevor, Mike’s roommate and best friend, has an idea – Trevor needs someone to do a job for him. Specifically, he needs Mike to deliver drugs to a client. Mike is insistent, at first, that he will not perform the job for Trevor. But Mike desperately needs money in order to keep his grandmother in her nursing home. And so, eventually, he obliges. Meanwhile, at the prominent Pearson Hardman law firm, Harvey Specter has just been promoted to senior partner. It’s his job, now, according to Jessica Pearson to find a Harvard graduate to take under his wing as an associate. Egotistical, snarky, and witty Harvey isn’t too fond of this idea at all. But he obliges, and sets up interviews at a local hotel. Mike’s photographic memory for detail prevents him, at the last moment, from following through with Trevor’s job upon realizing that the “clients” he was about to sell to are actually undercover cops. In an attempt to escape, Mike finds himself right in the interview corral for Harvey’s associate. Donna, Harvey’s snappy assistant, lets him in. It’s there that Mike receives the job to become Harvey’s associate at Pearson Hardman, with Harvey fully aware that Mike never finished college, let alone graduated from Harvard. But Harvey takes a liking to Mike – perhaps because he sees similarities between himself and the young man. Whatever the reason, the two are keenly aware of the fact that they need to keep Mike’s less-than-legitimate degree secret from Jessica, Donna, and – perhaps most importantly – Louis Litt, Harvey’s in-house rival. The pilot of Suits is really something quite spectacular. We’re introduced to characters who we assume have no moral compass whatsoever. Harvey seems like he’s always out for himself, and Mike’s lying and cheating ways hardly give us pause to pity him. But glimpses of humanity (Harvey’s treatment of Mike, Mike’s desire to provide for his grandmother, etc.) shine through and illuminate these characters. Is Harvey egotistical? Yes. But Harvey, as he tells Mike and everyone else who will listen, always wins. He’s insanely good at what he does. And though he may come across as cold and heartless in his treatment of Mike, it causes Mike to become a better lawyer, not because Harvey desires for Mike to act like HIM, but because he desires for Mike to learn FROM him. And the two characters only grow from the pilot. Really, if you haven’t watched Suits yet, I HIGHLY recommend it. And you still have plenty of time to catch up on all of the episodes before the show returns in January! P.S. Honorable Mention Award/The How-Could-I-Forget-To-Include-This-Show Category: Pushing Daisies' pilot. I mean. Thanks to Shawn for reminding me about this, because it completely slipped my mind to include it. BUT IF YOU HAVEN'T YET WATCHED PUSHING DAISIES, PLEASE PLEASE DO. It's the most brilliant, short-lived series. The Breaking Bad pilot was incredible. So was the Lost pilot. Both shows were on their A-game out of the gate, which is rare for most pilots today, I think.